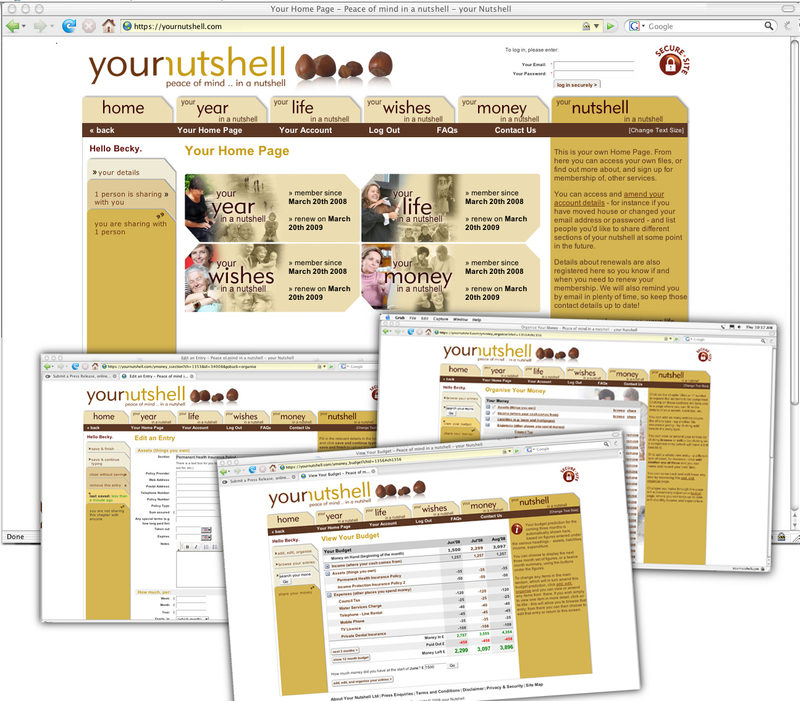 Your financial records and your household budget, securely online - it's Your Money in a Nutshell! An innovative new service has just been launched to help households record important financial information safely in one place, and then use that as part of an interactive budgeting tool - privately and securely - online. 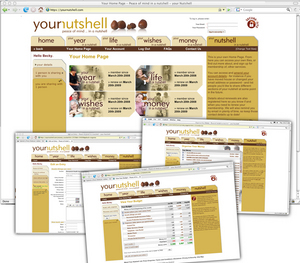 It’s one element of a website, Your Nutshell (http://www.yournutshell.com/) which offers a number of interlinked services. As well as the money section, there's also an online diary, the facility to store memories with pictures, sound and video, and a system to record your living will. Combined, they provide a virtual filing cabinet and a snapshot of the user at any one moment. The section Your Money in a Nutshell gives you prompts to follow, to record everything about assets, liabilities, income and expenditure. This includes contact details and policy numbers, fire-, flood- and burglar-proof if ever they’re needed in a hurry, plus the payment amounts coming in and going out. These figures in turn automatically populate the unique household budget forecast. It’s straight-forward to complete and totally interactive, with lots of FAQs and a video help system. It presents you with both a three-month and twelve-month budgeting tool to keep on top of your finances, and make sure the credit crunch doesn’t take you by surprise. It's useful both for more established households with regular income and expenditure and for others just starting out, such as students or those setting up home for the first time. And membership can be given as a gift. The website is totally secure – it’s password-protected at several levels and encrypted, and only you have access to your files. But of course the unexpected, in the form of illness, accident or worse, can take any of us by surprise; and members are encouraged to leave instructions about access to their account with a solicitor or executor, or stored with their Will. Should something unforeseen happen, those left managing your financial matters would find everything far easier to administer having it recorded in one place, removing unnecessary stress at what would already be a difficult time. Both the facility to record those important details and the nifty budgeting tool offer something extremely useful in these uncertain times. And having completed the records and uploaded any useful documents, such as scans of policies or voice recordings as well, you can relax in the knowledge that you’ve taken steps to organise your finances - put your house in order, as it were - safely and in total security, online. You can then enjoy the more light-hearted parts of Your Nutshell, and record your memories or what you and your family get up to during the year in the knowledge that it’s stored to look back on later. Your money, your year, your life, your wishes – it’s all about you in a nutshell!